Boy, we have let our popular little blog fall into disrepair! It's been a barn burner of a spring. We have been out exhibiting at trade shows literally across the country and we have visited customer's in just as many places. Travis has been pushing hard to complete a new catalog and it's going to be our best one yet. After a long and unusually cold winter this beautiful spring looks like the way our economy is heading...bright and sunny. Our little start-up division, ID4Sports, has had event sponsorships all over the country just about every weekend and we have exhibited at a few sporting events festivals. 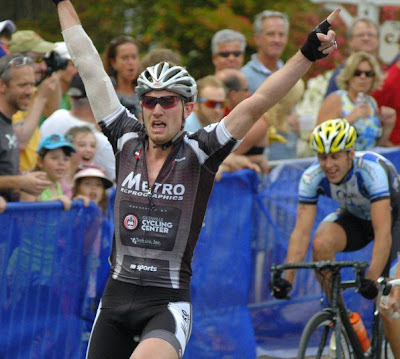 This past weekend one of the pro racers on Team Metro, the cycling team we sponsor, won the Pro 1/2 Criterium in Roswell, GA. Congrats Andre Vandenberg! We will try to get back to our regular posts on the promotional products and photo ID industry. Until then, enjoy your spring and don't be a stranger! PS: Become a facebook fan for ID4Sports. Just click on the icon on the ID4Sports homepage!